I wrote this as a reply to this post by ndozo. I put it here so I could edit it. I was going to put it as a reply to her post and then delete it here, but then I decided to leave it here too. Austin is not the sleepy friendly city I moved to. It's gotten too many people for its roads, and developed an attitude that fits more with the "Don't Mess With Texas" slogan than the old "Drive Friendly" slogan that pleased the hitchhiker me those many years ago. Even so, it's still beautiful around here and not all of the friendly laid back people are gone. And yes, the pools are great. 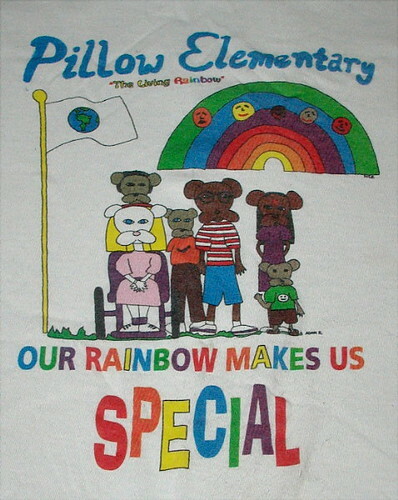 But yesterday, after having a run-in with a Sears Auto Service Employee that made me just want to move away to Anywhere-But-Here, I realized that the main thing that's keeping me here is the wonderful diversity at Georgie's School, Pillow Elementary. Not only are there students from all over, but the school works hard to unite everyone while delighting in, rather than ignoring, any cultural differences. The result is a wonderful blending of cultures that Georgie thinks is natural. If I could find another small city with beautiful countryside and a culturally and ethnically diverse population. And, if I could find a school as cool about it as Pillow, then maybe I would move. Or if I could find an affordable place in Brooklyn I would move there, because really cool people live there. I'll always have fond memories of this town, no matter where I am. Despite the growth, there are still so many quiet spots to relax. I would like to promote the "There are better places to be than Austin and why don't you move there" campaign. I don't think Buenos Aires is one, though there are some great things about it.